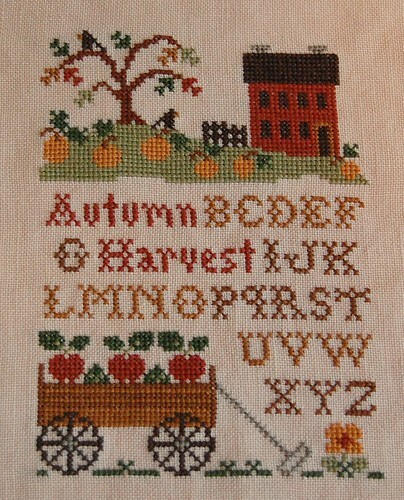 Nicole's Needlework: Autumn Harvest Finished! I got Autumn Harvest finished last night. It was a fun stitch and appropriate because a little cold front came through and now we have wonderful cool mornings. I'm hoping it stays that way! I have missed fall so much! 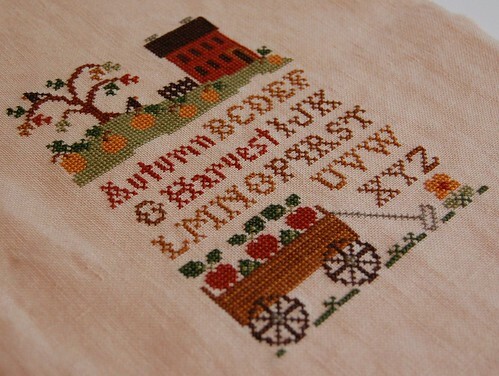 Little House Needleworks "Autumn Harvest"
It's "Seasons of Change Row" by Bent Creek. I started at the end (on the fall side) and I'm going to make my way towards winter. I did finally hear from Debby last night. She has been without power and water for almost two weeks now! She borrowed a neighbor's generator to get online last night. She's hoping to have her power and water back on today! Hopefully she does, I couldn't even imagine what it's been like for her - I'm glad she is safe though! I was worried! Oh I love that one! So wonderful for Fall. Lovely finish! Your next project is going to be adorable too. Congratulations on a great finish. I'm starting to see many autumny (is that even a word?! 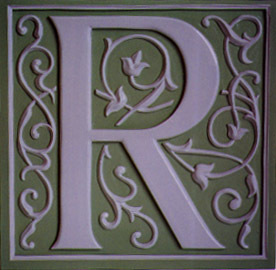 :) ) designs popping up on several blogs, and it's really putting me in the mood to start an autumn design myself. I have a couple of wips that I have to finish first, though. Have you made any more progress on Celtic Autumn? Seeing your progress inspired me to start mine as well. Andrea very generously shared her conversion with me, so hopefully I'll be able to start stitching on it this weekend. Looks beautiful! I missed autumn too and am so glad it's here! Adorable finish Nicole! I'm glad that your friend is ok...and I can't imagine how bad that must be not to have any power or water for 2 weeks! Oh this is wonderful! And your next project looks great too. You are so fast it's amazing! Autumn Harvest looks wonderful ! Amazing! I love the colours. 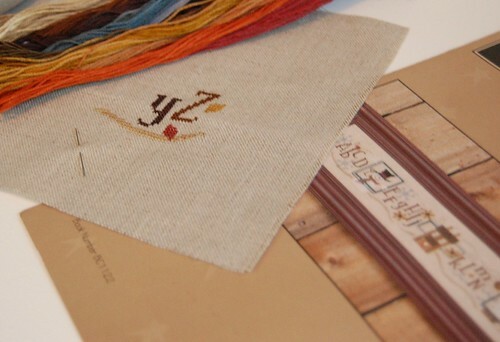 I need the same time to think to stitch a project, as the time you take to stitch and finish it!LOL! You are too fast!!! Wonderful finish and great start! Great finish! I have this one high on my to do list also! That is so cute. Fall is my favorite season to stitch. Question for you -- is your house a disaster? Please say yes because I will feel rotten if you have time to stitch this much AND clean your house. Congrats on the return of fall. No doubt it was just waiting for you to be ready for it with that lovely stitching. Lovely finish on Autumn Harvest (I wonder why it's not called "Fall Harvest"! ) and great start on Seasons of Change. You have done so much stitching since I was in here! It is so beautiful too! I love it!! Thank you Nicole for all of the kind words and concern for me!! Thank you to everyone here who expressed good wishes for me here after Hurricane Ike. We are still without power but hopefully it will be back on soon! We are very hopeful! At least I can get online and see you all! That is beautiful - Autumn's my favorite season; I'll have to stitch that! your finish is awesome. Can't wait to see progress on the new piece. It's lovely, Nicole! It makes me want to get started on mine! Your LHN pieces looks wonderful! I am planning to stitch that next- have it all kitted up!